I bought a bunch of battery powered sets (of 10) LED mini lanterns on eBay. You can get them in various designs for as little as $1 to $2 a set if you hunt around. Don’t pay the $15 some sellers want. You may have to wait for them to come on special. Of course I want to use them on 12V, not waste money on batteries each time. So this mod does that and puts a standard (for my display) 2-pin connector on them. First, desolder the wires from the battery holder. The wire going the the resistor is the positive. 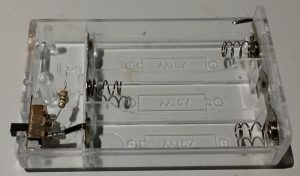 The wire going the the battery spring is the negative. 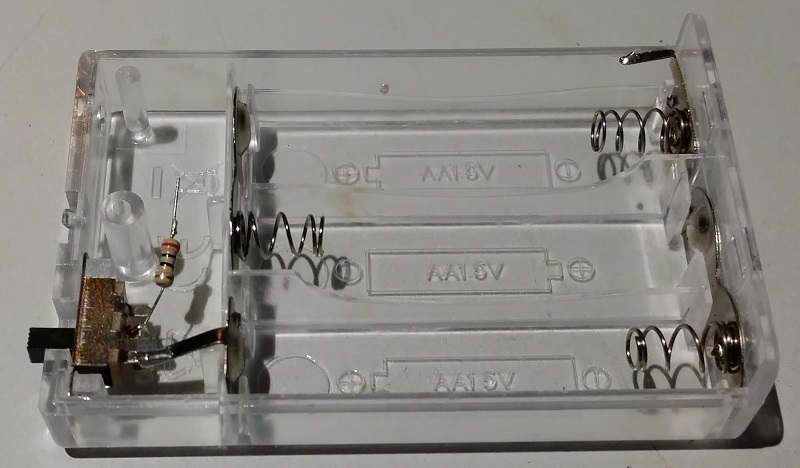 A 270 Ohm 0.6W (you could use a 1W type) resistor goes inline with the positive wire. This sets the current of the whole string to 35mA (3.5mA each LED). That may not sound like much, but it’s plenty bright enough for Halloween. The resistor dissipates about 0.3W in heat, so don’t use a small wattage resistor. If you use a 470 Ohm resistor they will be a little duller, but still quite usable. After testing that the lights work, the joint is covered in silicone. I use a very runny version, but regular silicone is fine. Now slide the heatshrink over the siliconed connections. You did remember to put the heatshrink over the connector tail first didn’t you? Shrink it down and wipe off any excess silicone that squeezes out. Voila, we have a set of LED lanterns that run from 12V. 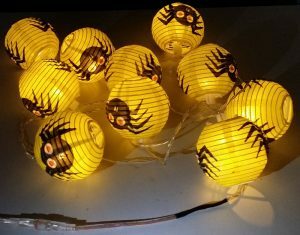 I use those connectors (from Ray Wu) on a lot of my Halloween items. I usually put a cable flag on to indicate the working voltage. If you want the lights to flash, you could use a $1 dimmer module.